This is Bricc back with another review. I'd usually be out on a Sunday, but today that isn't the case, and with the opening of the new recruitment, I thought it'd be the perfect time to write the first part of my editor application. While searching through the featured games page, I happened to come across the game "Puzzle Pyramid" by rjgsuper. It looked interesting to say the least, so I decided to give it a shot. Either way, at some point I have to review a feature worthy game and one that isn't, so it didn't really matter to me whether my expectations were to be blown out of the water or to be sunk to the ocean floor. With that said, let us begin! The thumbnail for Puzzle Pyramid is very dull and unattractive. It showcases what seems like a clutter of blocks on the left, and a blocky pyramid to the right. It's clearly a snapshot of the game's one and only level with no attempt at a custom thumbnail whatsoever. Visually, what's there is really plain and boring, and since it's a snapshot of the level, it gives us some sort of insight on what to expect from the game. In this instance, for me, it wasn't a positive insight. You can see there is a really simple dark blue background, reminiscent of the default PPG background. It's generally accepted as a "bad" background and tends to indicate a lack of effort due to many game makers not taking the time to change the background settings. This thumbnail definitely needs a dash of vibrance to it and preferably be custom made. It doesn't really give any information out about the game, either. We already know it's going to be a pyramid of puzzles from the title, and if anything all this thumbnail serves to do is turn people away from the game. With a lack of an attempt at making a thumbnail, I can already feel a lack of effort put into the game overall, though we're still yet to see if this is indeed the case. As you'll see throughout this review, this game has a lot of unused, thrown away potential. This is certainly true for the story, because there isn't one. A game needs to have all of its elements work well together: the art/scenery, the gameplay and the story. Yes, this game would work without a story - and it does. However, it would work better with one because it would then better link the elements of the game together. Why not style the game around an Egyptian pyramid in which the player has been permanently banished by a corrupt god and must make his/her escape? This, of course, could be built upon, or even be left vague for the player to develop their own ending in their imagination. When you watch a movie, you follow a story around a character (generally) and then have empathy for them and want them to succeed in their goals. A game's storyline can work the same, but instead of progressing through rooms in an ancient pyramid in order to obtain a staff to defeat the gods, and feeling as if you have saved the country from this mythical creature, you just beat a game with no meaning. Sure, it's still fun to play, but the player isn't as involved as they could be. Not having a story (combined with the faults we've already established) just adds to my "this game has a lack of effort and was made for a quick feature" feeling. I know I've talked down on this game quite a lot already, but I do want to emphasize that I do think Puzzle Pyramid is a good game, it's just that it's not much better than "good". I love the concept of this game despite it being so simple. You have a pyramid on the left and a downscaled one on the right to show your progress. There are a total of 15 rooms, with the top of the pyamid being one room and the bottom being 5. For each room you complete, the corresponding room on the smaller pyramid will turn green, allowing you to pass through it. Your player starts at the top of the smaller pyramid and must reach the bottom by going through the green rooms, meaning by completing rooms on the upscaled pyramid you unlock a pathway to the end on the smaller one. If you fail a room, the corresponding room on the smaller pyramid will turn red and you'll never be able to pass through it. It's a simple concept, but surprisingly hard to explain in a concise paragraph! What I really love about Puzzle Pyramid is that you can choose from a variety of different pathways to reach the green goal at the bottom. For example, if you messed up on the left room on the second row down, you'd have to complete the one on the right or you'd no longer be able to progress. In all honesty, though, this is something more or less any intermediate PPG maker could create, so rjgsuper was lucky to think up this concept before anybody else. The controls are extremely simple, but they work well for the game; green blocks can be moved with the arrow keys and blue can be dragged with the mouse. I think this is great, because literally any player can pick up this game and understand what to do. One issue here, though, is that sometimes when you click on a green block to select it, it'll move in a random direction and usually hit a red block, causing you to fail that room. I know this is a PPG bug, but it could have been prevented by placing a touchable platform below the player in each room (since that's the direction it tends to move in by itself). Apart from that little bug, the player movement is quite smooth as rjgsuper has enabled motion gravity and disabled gravity - a very appropriate choice for a game like this, especially as the player goes through some seriously tight gaps in some cases. While everything that's there works consistently, it does get old, and quick. All you really do is drag some blocks around or move them with the arrow keys, and in each room it's just avoiding the red walls. There could be button sequences; maybe even some rooms that could join together with the press of a button in one of them. I feel that the game needs just a little bit more to it in order to feel less repetitive. Puzzle Pyramid is only one level, so it isn't as bad, because if I had to do the same thing for 8 more levels I'd have no perseverance to do so. I do wish rjgsuper would've made it a little more clear initially that you had to move the player in the smaller pyramid, though, because at first I thought as soon as 5 connecting rooms were green you'd win, hence why I was left a puzzled Bricc for a while. Generally, the placement was average. The puzzles were clearly not thought out very much but rather put together quickly. It still works fine, and is still a bit of a challenge, but in reality this wasn't really a puzzling game - just a challenging one. It's more or less a test of how accurately you can move your mouse along a course or how well you can lightly tap the arrow keys to fit into a gap. Some rooms could have required the player to think a bit by having to pressing buttons, and that sort of thing. I feel like there wasn't enough content, though, and that if there was more varied gameplay, there could've been so many more levels that would be fun to continue playing. On the other hand, though, the way the game is right now fits better as one level, because its replayability has already hit a zero for me, and I haven't even beaten it yet. Back to my complaining, because the artwork in Puzzle Pyramid seriously dissatisfies me. It's merely an outline of a pyramid with red walls inside to kill you. What this game could have utilized and would've worked so well with is the default PPG textures, because literally everything just looks too basic. This is another situation where I would say the game would've worked better if it was themed; the pyramid could have been more triangular and looked more like an Egyptian pyramid. This would allow for more interesting details in other areas. For example, a sandstorm background showing intensity and a huge desert full of decorations like cacti. It wouldn't have been hard to do that, and this is another thing that just makes the game feel a lot more effortless. Credit where credit is due, you can clearly make out what each object is. Red is known as the colour of danger and therefore by instinct, players avoid it without rjgsuper explaining that they make you fail. Coins being yellow also makes it easy for the player to realise that the goal is to collect them. Again, with the visuals, there is just way too much unusual potential. No game maker is going to be perfect, but there are way too many flaws here. 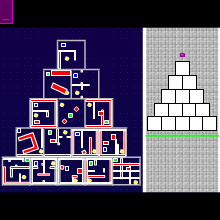 I have to say, I think rjgsuper has gotten the difficulty just about right with Puzzle Pyramid. The further down the pyramid you get, the more difficult the rooms become. This makes sense because you get more opportunities towards the bottom as there are more rooms. At the same time, they aren't too hard to be totally inaccessible to average players. While the difficulty is pretty much where it should be, because the gameplay can become extremely tedious (particularly if you lose 2 to 3 times), it's easy to lose motivation to go back and recomplete the rooms you've already done. Though, I would say this issue is down to the gameplay, so I won't really deduct any points from the difficulty because of it. If rjgsuper had stuck to a theme for this game, there could be more dangers involving themed objects rather than just red walls. For example, with my ancient pyramid theme, there could be falling bricks that you have to time correctly to pass. All in all, I'd say this is probably one of the better aspects of the game. Story • 2/5 • I'd usually give this N/A, but I see so much potential that never came to be, so I'll give it just a slightly below average instead. Thumbnail • 1/5 • Very poor. No effort whatsoever. Gameplay • 3/5 • Nice concept, works consistently (apart from movement bugs), but needs work. Difficulty • 4/5 • Gets significantly harder towards the end but still gives the player a chance. Straight up, this game is not feature worthy. There are far too many flaws and it really does feel like a game that was put together in a couple of hours in an attempt to get a quick feature. I loved the concept and ideas behind it, but it could have been executed so much better and failed to impress. I didn't quite finish the game, and I don't plan to, because I've chosen not to sacrifice my sanity. A sequel with some better ideas/theming implemented would be awesome, but due to rjgsuper's inactivity, I doubt we'll get to see that.